New to yoga? No problem. Whether you’re seeking increased flexibility or a workout that challenges your whole body, this is a great way to get started. 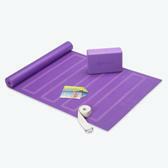 The alignment yoga mat features guides to correctly position your body during poses. Modify difficult poses, feel supported, and increase your flexibility with the yoga block. 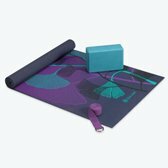 The yoga strap invites you to increase your range of motion and deepen your stretches, and the Yoga Beginner's Experience DVD features two yoga workouts and a meditation preparation. - Two full-length yoga workouts. - Helps with proper positioning and support. - Helps guide hand and foot placement. - Lengthen and align stretches.